8 Best Smart Turbo Trainers (2019) - Read This BEFORE You Buy! Thinking of buying a smart trainer but not sure which to choose? In this article, we review eight of the best smart turbo trainers to help you make the right choice for your budget and requirements. Modern smart trainers allow you to tackle almost any type of training session without leaving the house, so they are great for injury recovery, avoiding bad weather, or for people who don't feel confident on roads. Whether you want to practice sprint reps, run power-focused time trials, re-build your stamina after an injury, or just go for a leisurely ride, a smart turbo trainer removes the unpredictability of outside conditions. You can also take part in interactive training sessions or race against other riders. With a wide range of trainers on the market, however, it's not always easy to choose the "best" model for your requirements and budget. Clever marketing and inconsistency about what makes a trainer "smart" can add to the confusion. Why Buy a Smart Trainer? What's the Cheapest Smart Turbo Trainer? A smart trainer can connect and be controlled by third-party apps, such as TrainerRoad and Zwift. The best models also replicate the conditions and feel of a real road, including hills and even headwinds. This allows you to get close to a real training session without leaving your home. It's important to be clear about what we mean by "smart" though. A true smart turbo trainer provides a two-way interface between the computer (or smartphone app) and the trainer. This means the app can control the resistance of a trainer​. When you're going down a "hill," the resistance of the bike should decrease, and vice versa. When you're riding in a group of other virtual riders, the resistance should also decrease to adjust for the draft effect. There are cheaper stationary trainers available that track metrics such as distance and time via a mobile phone or computer, but resistance needs to be adjusted manually. There's nothing wrong with these models, but we don't consider them "smart." On a technical level, turbo trainers usually connect to a computer via Bluetooth and standard Wi-Fi​ signals, so they should be compatible with most modern devices. Not all laptops have Bluetooth - but most have ANT+ Wi-Fi. Can even the most advanced smart trainer ever beat the experience of an open road? As with standard smart trainers, there are two types available: wheel-on and direct-drive. It's important to understand the advantages of each before you buy. Wheel-on smart trainers are the most common type. They are cheaper than direct-drive and easier to start using, as you don't need to remove the rear wheel or use an extra cassette. The downsides are that they provide less accurate measurements of power output and don't calibrate immediately. Direct-drive smart trainers aren't as easy to use, as you'll need to remove the back wheel and attach a cassette. Once the bike is attached, however, they provide more accurate power measurements and are ready to use immediately (there's little or no calibration required). The biggest downside is the cost. Speaking of power accuracy, this is one of the most important considerations when evaluating a turbo trainer. Inaccurate or inconsistent power readings can make competing in races or other events frustrating - especially if there is a significant lag when accelerating (which can be the case with wheel-on trainers). A trainer with an accurate built-in power meter can also make your workouts more realistic. There's always the option of using an external power meter though. This adds to the cost, but you can use the meter for Zwift's power measurement and the trainer for generating resistance. Despite the relatively advanced technology, smart turbos don't need to cost a fortune. While the priciest options have more advanced features, the wide range of manufacturers - including TacX, Elite and Wahoo - mean there are plenty of options for most budgets. With that said, the more you spend the better the all-round experience - especially if you're interested in accurate power measurement. Note: This page is specifically about smart-enabled turbo trainers. If you just want a basic "non-smart" trainer, check out our page​ about turbo trainers without smart functions. 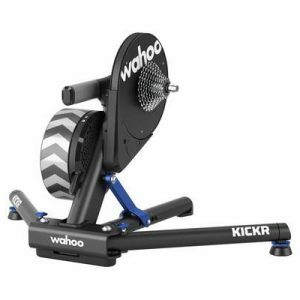 One of the most popular direct-drive smart turbos is the Wahoo Kickr. It arguably started the trend towards "smart" rather than "dumb" turbo trainers, mainly because it was the first open platform that was compatible with a range of apps. The latest version of the Kickr (2018) provides a significant amount of new features, so even serious cyclists won't be short on data when training.​ The direct-drive unit provides accurate measures of power measurement, while the machine can simulate up to a 20% incline and 2200W of output. It's also now compatible with Wahoo's Climb simulator. In short, the Kickr is capable of handling the demands of almost any rider.​ The latest version also matches the maximum power output of the Tacx Neo Smart, despite being cheaper. It also provides a smooth and satisfying ride due to the relatively heavy 7.26kg flywheel and electromagnetic resistance. The downside is that it's hefty to carry, although this is helped by the adjustable legs and handle. Other features include speed, distance, cadence and power functions, compatibility with almost any device (including Android and iPhone), and an 11 speed SRAM/Shimano compatible cassette. PROS: Easy to use with most common apps, heavy flywheel provides a smooth ride, wide range of compatibility options. CONS: There are cheaper direct-drive models available, can be awkward to carry. 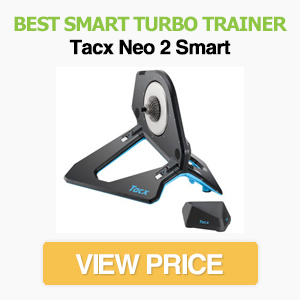 If you're looking for the most advanced smart trainer, you would be hard pressed to find one that beats the Tacx Neo 2 Smart. It's not cheap, but is a joy to ride and has features most other smart trainers don't include. Let's start with the basics though. The Tacx can handle a maximum resistance of 2200W, which is one of the highest on the market, along with a 25% incline. It's compatible with common software such as Zwift, can handle guided workouts and communicates via both Bluetooth and ANT+. It also has accurate cadence and power readings, along with separate measurements for both right and left leg. Unlike most turbo trainers, the Neo 2 Smart uses a virtual flywheel that's capable of simulating everything from gravel to cobblestones. That means you can really feel changes to road feel, making it much more immersive than almost any other trainer on the market. One of the great things about the Neo 2 Smart is how quiet it is. Despite the high maximum resistance, it's one of the quietest smart trainers on the market. We also like the "descent simulation" function. This provides a small boost when you ride downhill, which feels more realistic when you start pedalling after coasting. The biggest drawback is the price. With an RRP of £1199.00, it's the most expensive on this list. It also doesn't have a handle. Even so, it's one of the most advanced smart turbo trainers on the market. If you can afford it, there aren't many that can match the features and realistic feel of the Neo 2 Smart. PROS: One of the most advanced trainers on the market, high maximum resistance, smooth and realistic road feel, excellent "descent simulation" function. CONS: Expensive, not as portable as other options. If you want a direct-drive turbo but the Neo Smart and Kickr are outside your budget, the Tacx Flux 2 Smart could be the perfect option. It provides a smooth ride that's relatively quiet - plus it costs several hundred pounds less than the top two models on this list. ​Unlike the Neo Smart, the Flux 2 Smart is built with a traditional 7.6kg flywheel and controlled by an electro-break that minimises maintenance. It's compatible with Shimano and SRAM cassettes and tops out at 2000W. This is lower than the Neo Smart, but considerably higher than the 1500W of the original Tacx Flux. It's also rare for most riders to exceed 2000W, so the Flux 2 can provide ample challenge. As you would expect, the Flux Smart has both Bluetooth and ANT+ communication options. It's compatible with common training software, such as TrainerRoad and Zwift. ​While the cheaper price makes it an attractive option, there are some downsides compared to the more expensive Neo Smart. The fixed legs mean it's less portable than the Kickr - although they provide a stable ride. More importantly, the 16% maximum incline is a lot lower than the Neo Smart's 25%, although it can go high enough for most Zwift courses. ​Despite these drawbacks, the Flux Smart provides excellent value for money if you want a direct-drive smart trainer. PROS: Smooth and realistic ride feel, great price for a direct-drive, relatively quiet. The first wheel-on model on this list is the Kickr Snap. It's designed to provide a realistic indoor ride for a lower price than direct-drive smart trainers. It also has a 12% maximum gradient and Kickr CLIMB compatibility. ​This is the new version of the Kickr Snap that was released in 2017. Wahoo has added several new features, including improved power measurement (+-3% accuracy) and LED indicator lights. The Kickr Snap has a 4.75kg flywheel that provides excellent road feel. The improved power accuracy is noticeable compared to the previous version, while the 1500W maximum power output and 12% maximum incline are acceptable considering it's half the price of the direct-drive Kickr. It's also a sturdy model that's built to last. The folding legs are useful for storage or moving the machine. Once folded out, the base feels sturdy and safe. ​There are some drawbacks - although these are mainly due to the wheel-on design rather than anything specific to the Kickr Snap. Like all wheel-on turbos, you need to calibrate if you want accurate power readings. This requires a 10-minute tire warm-up followed by a calibration spindown. PROS: Brilliant road feel, easy to setup, quiet, much cheaper than direct-drive models. CONS: Slight lag in power readings can be annoying when in races, requires calibration. 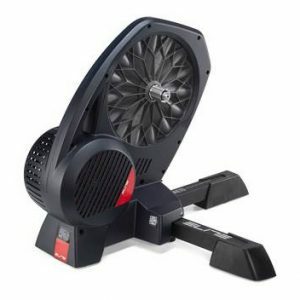 The Elite Drivo II is a direct-drive smart turbo trainer at the higher end of the market. While it's certainly an investment, the Drivo II aims to match the best when it comes to accuracy and durability - and largely succeeds. Arguably the best feature of the Drivo II is its excellent power accuracy. This is one of the most accurate turbos on the market (THE most accurate, according to Elite), mainly due to the redesigned OTS. It can also adjust resistance rapidly, so it feels more realistic in Zwift or Elite Real than many competing models. ​Even though the Elite Drivo II is marginally cheaper than the Neo Smart, it's still an expensive model. The combination of simplicity, robust design and accurate power measurements make it an ideal choice for any rider who takes their training seriously though. The only downside is that the casing looks (and feels) cheap considering the price - but this only affects the aesthetics. ​So, if you want a professional standard home training experience when it comes to accuracy, noise output and robustness, the Elite Drivo II could be a great choice. A direct competitor to the Flux Smart is the Elite Direto. It's a stripped-back version of the Italian ﻿company's top-end Drivo, yet features many of the same features including an Optimal Torque Sensor (OTS) power meter and smooth ride. The Direto has a maximum power output of 1400W. This is slightly lower than the 1500W of the Flux Smart, although the 14% maximum incline is better suited to riding hills on Zwift or other training packages. ​One of the best features of the Direto is its accurate power calibration. The OTS system provides a consistent read-out and there is little noticeable lag. The Elite's foldable legs are also handy for storing the machine but don't compromise stability when riding. ​There aren't many downsides to the Direto - especially considering the low price for a direct-drive model. You'll sometimes come across inclines of more than 14% when riding mountain climbs on Zwift, but for most virtual routes a 14% incline is plenty. There's also a stutter in power if the resistance app is re-activated after coasting. 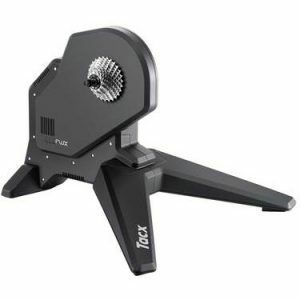 If you're looking for the cheapest smart turbo trainer that we recommend, the Tacx Vortex is the one to go for. It lacks the advanced features of more expensive models, but is easy to setup and provides a consistent power reading. ​With an RRP of £400, the Vortex is less than half the price of models such as the Wahoo Kickr. It still has ANT+ and Bluetooth connectivity, along with an electro break, so it can provide a true "smart" experience. ​As you would expect from a cheaper turbo, the Vortex is less accurate when it comes to power reading. The good news is that it's consistent - although the data won't match your outdoor power meter. ​It also provides a surprisingly smooth and realistic feel. The gradient changes are instant and it feels stable when in use. It's important to be aware of the drawbacks of this model compared to more expensive options though. Like all wheel-on turbo trainers, it requires spin down calibration if you want reasonably accurate power ratings. It also has a maximum incline and power of 7% and 950W respectively, which is much lower than the others on this list. 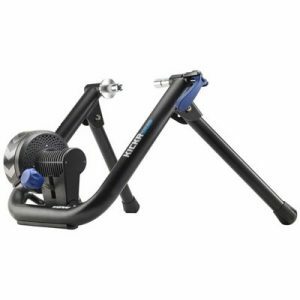 Even so, if you want a cheap smart turbo trainer for Zwift or other software, the Vortex provides great value for money. Note: An even cheaper option is the Flow Smart, which is the least expensive interactive trainer. It has a lower maximum power and incline than the Vortex though. 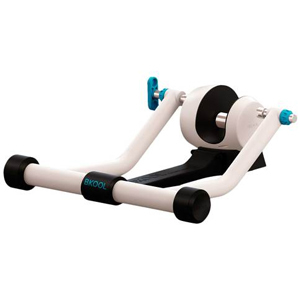 Another relatively cheap wheel-on smart trainer is the Bkool Go. While it doesn't have the features or performance of the pricier categories on this list, it's much less expensive and is compatible with Zwift, VirtualTraining and many others. 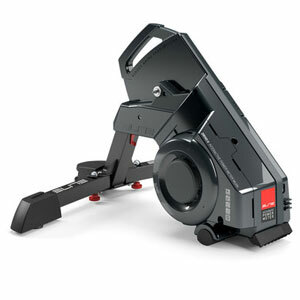 ​The Go has similar features to the Tacx Vortex - although the 800W maximum resistance is slightly lower. Bkool has included telescoping legs and a folding stand, so it's a relatively portable trainer, and it can simulate slopes of up to 8%. ​Like all Smart trainers, the Go comes with both Bluetooth and ANT+ connectivity, so it's compatible with third-party software. It also has a quick-release skewer system that's common to most wheel-on trainers. ​While the Bkool Go doesn't have many stand-out or advanced features, it's a solid smart trainer that's available for a great price. 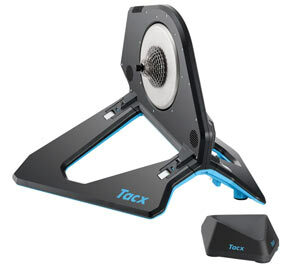 The cheapest smart trainer that we recommend is the Tacx Vortex. There are cheaper models on the market, such as the Elite Quibo, but the Vortex provides a great balance between performance and price. Virtual reality headsets, such as the HTC Vive and Oculus Rift, could potentially enhance the realism of turbo trainers in the future. The technology isn't quite there yet though. VR headsets are bulky and aren't designed for vigorous exercise, so we recommend sticking with a laptop, tablet or computer for Zwift. A number of retailers sell smart turbos. Amazon, Halfords, Evans Cycles and Argos are some of the most common, but there are many options. It's worth shopping around for the best deal once you know which trainer you want. So, there you have it. The eight best smart turbo trainers on the market, including models that suit a range of budgets. This depends on your budget and how you want to use the trainer. More expensive options are generally "better," but if you don't need the extra features or performance a cheaper model can still do a great job. 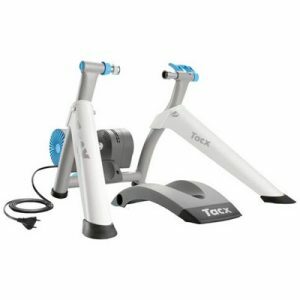 For those with a high budget, the two best turbo trainers are the Tacx Neo 2 Smart and Wahoo Kickr. Both are expensive, but provide excellent feel and accurate power measurement. The Neo 2 just about edges it due to the way it mimics descents and surfaces - although the Wahoo Kickr's smooth ride is hard to beat. We hope this article has helped you choose the best smart trainer for Zwift or other similar software. If you have any questions, please let us know in the comments section.